California is the largest producer of fresh strawberries, supplying more than 85% of fresh strawberries in the United States while accounting for roughly 65 percent of total strawberry acreage in the country. For the 2012-13 production cycle, over 40,000 acres were planted to strawberries in California, with a harvest during 2103 estimated to reach a record 2.8 billion pounds. Because of the magnitude of California’s contribution, maintaining production at or near current levels is critical to ensuring a sustainable, domestic supply of fresh strawberries. Accomplishing this goal will be challenged by regulatory constraints on the use of soil fumigation and other chemical inputs, and by loss of production capacity due to urbanization in coastal regions, where most strawberry production occurs in California. Summary: Critical to California’s success has been management of soilborne diseases using preplant soil fumigation with methyl bromide (MeBr). However, international regulations require a phase out of MeBr, likely completed in 2016. Alternative fumigants have been developed but regulatory pressures related to air quality and buffer zone requirements may soon render them unavailable. Consequently, non-chemical alternatives for sustainable management of soilborne diseases are urgently needed. Photo: A “buffer zone” is an area around a building where fumigation is not permitted. In the range of 60+ feet, this area is often still planted and can be an area of soilborne disease accumulation, as evidenced by this photo. Methyl bromide is a fumigant used to control pests and pathogens. In the case of strawberry production, soil fumigation with MeBr has provided essentially pathogen-free soil, as well as weed control, for the last four decades. Increasingly, growers are being forced to grow without MeBr because of the 1993 Montreal Protocol requiring 100% MeBr phase-out by 2005 (EPA, 2011). The impact of this fumigant is well expressed in the 30% yield increase experienced in MeBr-fumigated fields compared to organic fields (Cook, personal conversation, 2011). This is a major contributor to the price premium required for organic strawberry growers to recover production costs. Because of the significant yield benefits that California strawberries gain from using MeBr, growers have been granted annual ‘critical use exemptions’ that permit a set tonnage of MeBr per county. This amount decreases annually, with recent cuts being the greatest, as seen in 2009-2010, a reduction from 218,000 to 131,000 lbs for Santa Cruz and Monterey Counties (DPR, 2011). From a broader perspective, the loss of MeBr will require departure from a production system that has been researched and refined over the past 40+ years. To mitigate the impact of this change, research has focused on alternative chemical fumigants, some of which have now been widely adopted. However, restrictions for fumigants in California are tightening as seen with township caps on application of Telone, VOC regulations, barrier film requirements, and expanding buffer zones within which no fumigants can be applied. Consequently, the future of strawberry production, as stated by the California Strawberry Commission, is without fumigants (Legard, presentation at the Methyl Bromide Alternatives Outreach Conference, 2011). Organic growers have been using non-fumigant production systems for many years but continue to suffer from significant yield declines, and struggle to profit from a system that requires multi-year rotations out of strawberries. Thus there is a need to develop a biologically-based, integrated management strategy that will allow for profitable and sustainable production of strawberries without the use of chemical fumigants. My PhD research is directed toward this goal. Poster. UCD Department of Plant Pathology Retreat. October, 2013. FRESNO, Calif. (AP) — California farmers now must abide by the nation’s strictest rules for a widely used pesticide in a change designed to protect farmworkers and people who live and work near agricultural fields but is likely to raise prices on produce. Macrophomina is one of the emerging new pathogens causing collapse of strawberry plants. With the impending loss of the methyl bromide fumigant for use in combating soilborne diseases, researchers anticipated that new challenges would eventually emerge and affect strawberry production in California. Such new challenges have indeed developed. Beginning in 2007, growers who no longer used methyl bromide began to see weak spots in their fields where strawberries did not grow vigorously, produced fewer fruit, and eventually collapsed and died. These problematic areas increased in size in subsequent years. In some locations, a large percentage of the strawberry plants performed poorly and died prematurely. Such plant losses could have significant effects on this industry, which produces approximately 80 percent of the nation’s strawberry crop. 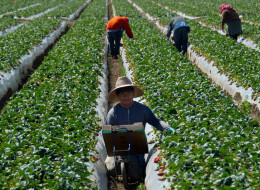 A UC research team consisting of county-based farm advisors (Steven Koike, Oleg Daugovish, Mark Bolda) and campus-based researchers (Tom Gordon, Husein Ajwa, Krishna Subbarao) initiated a multi-year investigation of the problem with funding from the California strawberry industry. The UC team discovered that the strawberry problem was caused by two distinct soilborne pathogens,Macrophomina phaseolina and Fusarium oxysporum. It now appears that the previous practice of using methyl bromide + chloropicrin soil fumigation was able to suppress the development of such new problems; with changes in soil fumigation practices, these pathogens were able to become established and cause crop loss. Prior to their study, neither fungus was known to occur on strawberries in California, making their report the first record of these strawberry diseases in the state. Further investigations documented that these new pathogens are present in three major strawberry production areas in California, that alternative chemical soil treatments provide some but not complete control, and that a few strawberry cultivars are apparently resistant to the new pathogens. Management options for growers have been presented to the industry at extension field events. Additional research is planned to further study the biology of the pathogens and to develop additional resistant strawberry cultivars. Strawberry industry put on alert regarding emerging threats. This UC research team was able to identify the nature of the strawberry collapse problem occurring in various counties in California. Growers now are aware of these emerging pathogens and can take steps, such as the cleaning of farm equipment, to limit the spread of infested soil into clean fields. Researchers and growers are collaborating to seek out ways to manage the two diseases. UC breeders are initiating research to develop resistant strawberry cultivars. UC research and extension programs, therefore, are actively working to protect this $2.3 billion industry. Read below or listen here. In California, a legal skirmish has erupted over strawberries — or rather, over strawberry breeding. To be absolutely precise, the battle is about strawberry breeding at the University of California, Davis. This is more important than it might sound. More than half of all strawberries in the supermarket trace their ancestry to breeding plots at UC Davis. The strawberry breeders at UC Davis, who’ve led that program for decades, are leaving the university to carry on their work at a new private company. Before getting into the details of this dispute, it’s worth a little background on strawberry breeding itself, and where the modern strawberry came from. “It’s a pretty amazing story,” says Jim Hancock, a professor of horticulture and a berry breeder at Michigan State University. It begins with two different berry plants growing in completely different parts of the world a few hundred years ago. One plant in Chile produced nice big fruit that were kind of bland. The other, in the eastern United States, had berries that were bright red and bursting with flavor, but tiny. Both species were picked up by European collectors — in the case of the Chilean plant, by a French spy — and ended up close to each other in a French botanical garden. There, they made babies. “It was a perfect combination,” says Hancock. The accidental hybrid that resulted from this cross-pollination produced fruit that was big, red and tasted great. The strawberry was born. It could still be improved, and that’s where plant breeders came in, crossing different plants, selecting the best offspring, and creating ever-better berries. “The No. 1 thing is probably having the ability to be picked, packed and shipped all the way across the United States and still arrive in good condition,” says Tom Sjulin, another breeder, who worked for many years for Driscoll’s Strawberry Associates, one of the best-known names in strawberries. There’s one thing that Hancock and Sjulin don’t mention at first: taste. That’s a bit of a sore subject in the strawberry community. “Being a strawberry breeder, I shouldn’t admit this, but I think for a long time, taste was going down,” says Hancock. Yet he and Sjulin both insist that strawberry taste has made a comeback in recent years. He shows me one that’s big, firm enough to travel thousands of miles, and has amazing flavor. It’s the Albion variety, and it was created at UC Davis. Which brings us back to that controversy. California has the perfect climate for growing strawberries, and UC Davis, as the leading agricultural university in the state, began breeding strawberries almost a century ago. It’s still the most important center of strawberry breeding in the country, although private companies, such as Driscoll’s, have gotten into the business, too. On the other hand, says Sjulin, private companies often don’t provide their varieties to everyone. UC Davis does. Any strawberry grower can buy them and grow them. “There are still a lot of growers in California who really depend on that University of California program continuing as is, and anything that would disrupt that is cause for great concern, as you can imagine,” he says. As the current strawberry breeders at UC Davis prepare to leave, some fear that this program will falter, interrupting the supply of new varieties to strawberry growers. 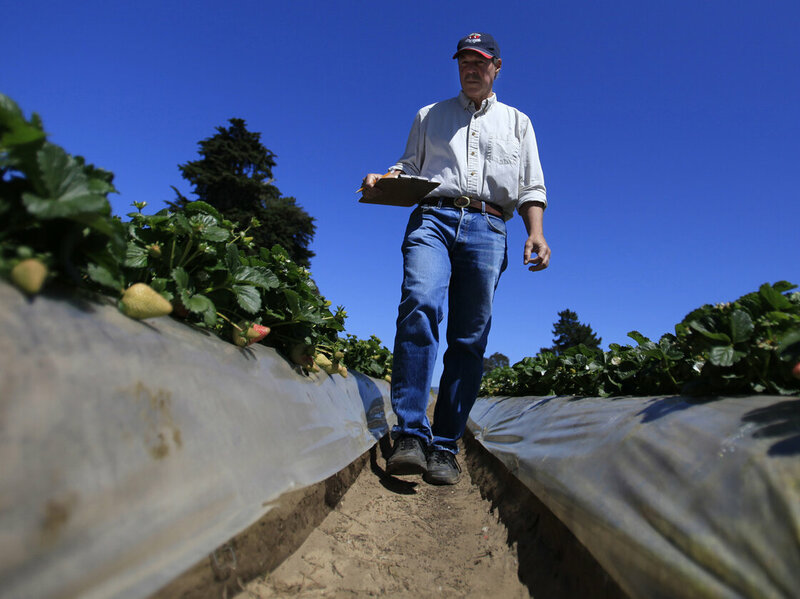 Douglas Shaw, a UC Davis plant science professor, walks through strawberry fields in Watsonville, Calif., in April. He runs a strawberry growing and test facility there. The man at the center of this controversy is Douglas Shaw, who has been in charge of UC Davis’ breeding program and now plans to go private. In an e-mail to NPR, Shaw wrote that he is not leaving the university to earn more money. He’s already paid very well. He and a handful of co-workers get about 30 percent of the royalties earned by the UC Davis strawberry varieties. In recent years, that inventor’s share amounted to more than $2 million each year. Shaw wrote that he is leaving because the university no longer cares about the kind of practical, commercially valuable breeding that he does. “We do not fit here any longer,” he wrote in the e-mail. Strawberry growers also worry that the university’s priorities are changing. “We got a phone call from the University of California,” says Carolyn O’Donnell, communications director at the California Strawberry Commission, an industry group that has helped to fund the UC Davis breeding program. “They said that we no longer needed to send them money because they were going to discontinue the [breeding] program” when the current breeders leave. This set off alarms. Farmers feared that future varieties, from the private company, might cost more and might not even be available to all growers. O’Donnell says the commission tried to convince the university to maintain the breeding program, but “we kind of felt that the university wasn’t taking us very seriously,” she says. So the commission sued. The commission is asking the courts to stop the university from “privatizing” strawberry breeding. It also wants to ensure that the university’s collection of strawberry varieties stays in public hands. Mary Delany, an associate dean of the College of Agricultural and Environmental Sciences at UC Davis, says the lawsuit is based on a misunderstanding. “We never said that we were going to close the program. We said that we are evaluating the program,” she says. The university has now decided to continue breeding strawberries, and is now looking for someone to replace Douglas Shaw. Shaw and his colleague Kirk Larson, who is also planning to leave for the private sector, did ask for permission to take copies of the strawberry collection with them, Delany says, but that request was denied. “This is University of California property,” she says. O’Donnell says that this is all good news, but before dropping its lawsuit, the commission wants more guarantees that the university will maintain a healthy, vigorous breeding program, aimed at creating that next great strawberry variety.